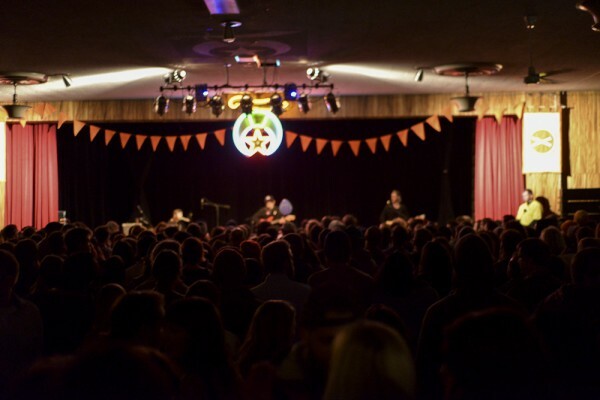 Treefort is upon us! Here are a few highlights from DHM’s first day at the festival. An in-store spoken word performance by Sage Francis at the Record Exchange preceded even Treefort’s official kick off and I can’t imagine a better way to have warmed up for the weekend’s festivities, i.e., by getting real with some capital “F” Feelings. When Sage speaks it is impossible to move. His presence fills any space and stretched the RX (crowded with humans, too, midway through the set) at the seams. Francis described one of the pieces as “The only love poem I’ve ever written,” which he’s admittedly recycled through three relationships, but claims it meant just as much every time. Having avoided being turned to stone (in a good way) by Francis’ saliva, I crossed the street to the El Korah Shrine temple to see Finn Riggins. Eric Gilbert, Treefort’s ubermensch and keyboard and supporting vocals of Finn Riggins, couldn’t hide his kid-on-Christmas-morning excitement and this translated to a tight and energetic set. Whenever the going gets crowded at Treefort, I inevitably make my favorite unexpected discoveries. In lieu of Foxygen and Unknown Mortal Orchestra chaos, I decided to catch Olympia, Washington’s Lake at one of Treefort’s all ages venues, The Crux (at which sound quality has been much improved from last year’s tinny loud loud loud). These kids are a charming pod of clean-faced feel good. Imagine if Yo La Tengo and Kings of Convenience procreated and sprinkled a pinch of sugar on the result and you’ve got Lake. After quick trip across the street, I settled in at Neurolux to wait for Earth and found the highlight of my night: Menace Ruine. This two-piece outfit I’d never heard of from Montreal just stole it. It’s been awhile (read: it’s been never) since I’ve seen a guy/girl duo get so heavy … sort of like if Beach House grew longer hair, stronger necks and bigger balls. Menace Ruine will be a hard act to follow, but I’m looking forward to what tonight brings.